tSBenefit show on March 10th! Team Up for Nonprofits presents Gigs4Good featuring Hot Bodies in Motion and Luc & the Lovingtons benefiting the Service Board. Come and experience a fun night of music for a cause with two of Seattle’s funkiest bands. 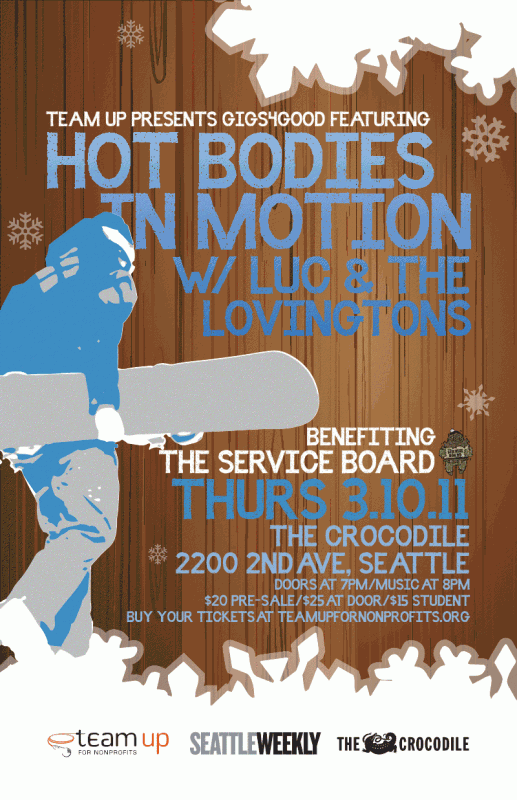 The very hot right now Hot Bodies in Motion will be supported by Luc and The Lovingtons who are fresh off their tour with Jason Mraz, at one of Seattle’s legendary live music venues, The Crocodile. Grab you tickets now as the last Gigs4Good benefit was a sellout! This Gigs4Good benefit will raise funds to cover the cost of transporting youth and mentors to the mountain this winter where they will build resilience and conquer fears. The goal is to raise $5,000 to subsidize the rental of seven buses that will safely transport participants to Summit at Snoqualmie, Stevens Pass and Crystal Mountain for Sunday riding. Team Up for Nonprofits mission is to build capacity for nonprofit organizations by cultivating a new generation of engaged supporters through the power of music and social media. Our Gigs4Good benefits raise funds and awareness for the nonprofits we partner with and provide an entertaining and accessible opportunity for people to support organizations making a difference. With Team Up you buy the tickets, we bring the music, nonprofits get the money! A huge thank you to The Crocodile for sponsoring this event. Without our sponsors Team up could not produce our Gigs4Good events so we hope you will support them in return.